South Korea's president has visited islands also claimed by Japan, in a move that raised diplomatic tensions. Lee Myung-bak flew to the islands, which are known as Dokdo in South Korea and as Takeshima in Japan. A Kyodo news agency report said Japan had recalled its ambassador from South Korea. Both South Korea and Japan say they have a historical claim to the islands, and the issue has been a long-standing thorn in relations. The islands, which are roughly equidistant from the two countries, are small but lie in fishing grounds which could also contain large gas deposits. The Japanese government's response has been swift - Tokyo has summoned the South Korean ambassador and recalled its own envoy from Seoul. The dispute over these islands is a sensitive issue and one that has often been a hurdle to the otherwise improving relations between the two countries. Many Japanese media outlets say it is inevitable that the bilateral relationship will suffer. Japan has a number of territorial rows, with China and Russia as well as South Korea, and they tend to attract considerable public attention. Kyodo also reported that the two countries had postponed an annual meeting between their finance ministers as an apparent consequence of the visit. "Today South Korean President Lee Myung-bak visited Takeshima. It is contrary to our nation's stance that Takeshima is historically - and under international law - an integral part of our national territory, and is completely unacceptable," he said. Mr Noda said that the visit was all the more regrettable because he and the South Korean president had "tried to push for a positive future between Japan and South Korea". "So for this visit to come at this time is extremely regrettable. I believe it is necessary for the Japanese government to take a resolute stance on this matter." South Korea has stationed a small coastguard detachment on the islands since 1954. Mr Lee is the first South Korean president to visit them. Then Prime Minister Han Seung-soo visited in 2008, sparking a row with Japan. The visit was announced by Mr Lee's spokeswoman early on Friday. The South Korean president first visited Ulleung Island before flying on by helicopter to the disputed area. 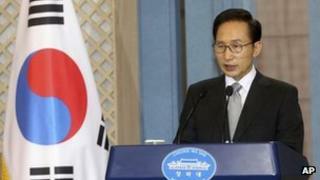 Reports from Japan said the government had both recalled its own envoy and summoned the South Korean ambassador in Tokyo. South Korea's Yonhap news agency said the country's military had stepped up security in the area ahead of the visit, which came as the two countries' football teams prepare to play off for the Olympic bronze on Friday. It also came shortly before South Korea marks the anniversary of the end of Japanese colonial rule. The issue has flared sporadically in recent years, amid lingering antipathy between the two nations over historical issues. Last month, Japan filed a formal diplomatic protest with South Korea after a man rammed his truck against the gate of its embassy in Seoul to protest against Japan's claim to the islands. In 2008 South Korea withdrew its ambassador to Japan after a book for Japanese teachers reportedly said Japan owned the islands.